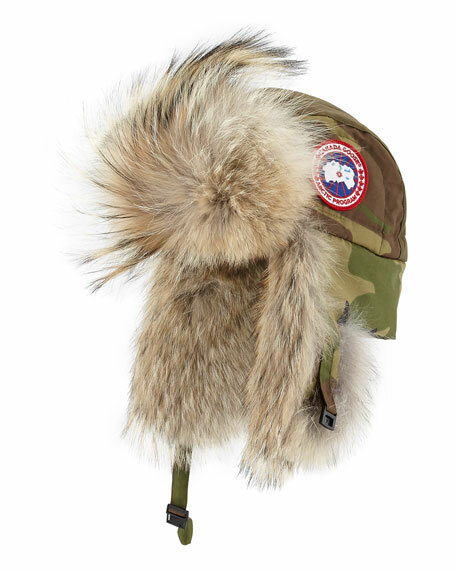 GP Luxe knitted fur beanie hat in dyed rabbit (China) and dyed fox (China). Pom-pom detail at top. Approx. 9"H x 8.5"W. Cotton mesh. Imported. Jane Taylor sinamay sting ray hat. Twisted crin trim. Cotton covered metal wire. Woven label. Straw/polyester crinalin/elastic. Made in United Kingdom. Jane Taylor cocktail hat with twisted crinoline trim. Metal wire and comb. Woven label. Straw/cotton/velvet/polyester crinalin/elastic. Made in United Kingdom. Keith and James "Queen" fedora hat in felt with signature red brim. Grosgrain band with authentic logo pin. Pinched crown. Keith and James "Queen" fedora hat in felt with signature red brim. Grosgrain band with authentic logo pin. Pinched crown. Flat brim. Wool; polyblend trim. Made in USA.